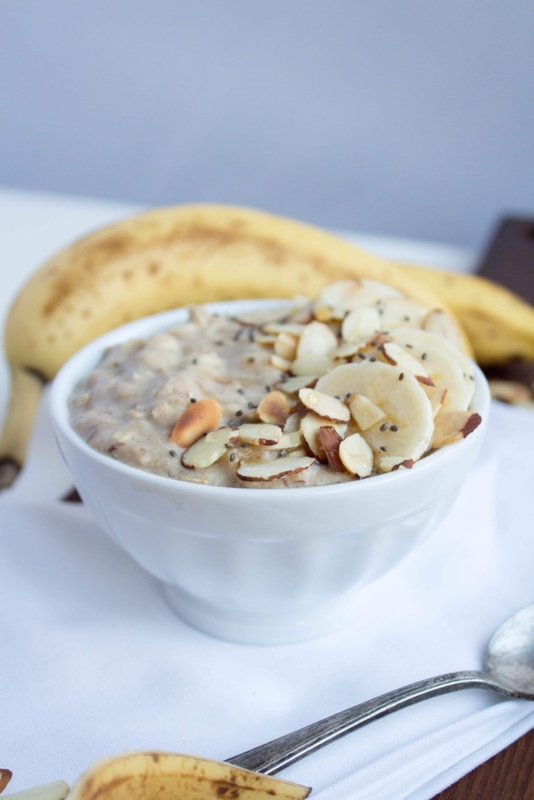 I have something good for you all today: a High Protein Oatmeal Recipe! Remember when I tried “Oatless Oats” awhile ago but wasn’t a big fan of the texture? Well, I decided to try a new version of high protein oatmeal, adding eggs to the mix but leaving some oats in there as well for texture purposes. It came out awesome! 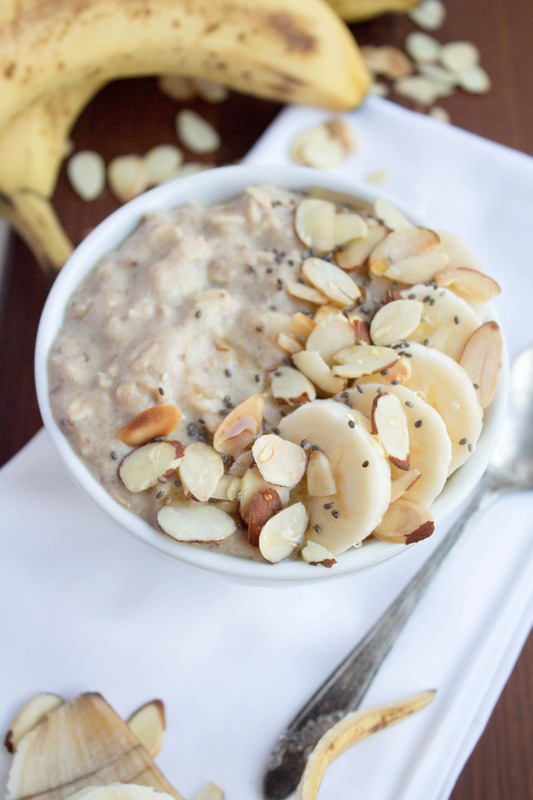 If you’re too busy for stove top oats, you can also make this in the microwave! Simply follow my Perfect Microwave Banana Oatmeal recipe, but before putting it in the microwave, whisk one egg into the oats/milk/banana mixture. That’s it – do everything else the same! 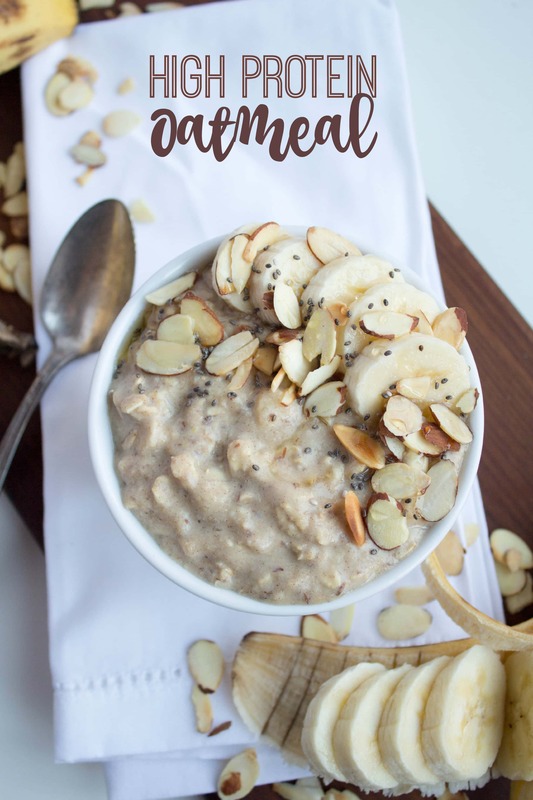 This high protein oatmeal recipe incorporates eggs to increase the protein while still keeping the usual oatmeal texture, and ground flaxseed adds some healthy fat to the mix! For a more filling breakfast, enjoy topped with berries, nuts, seeds, additional banana- whatever you like! 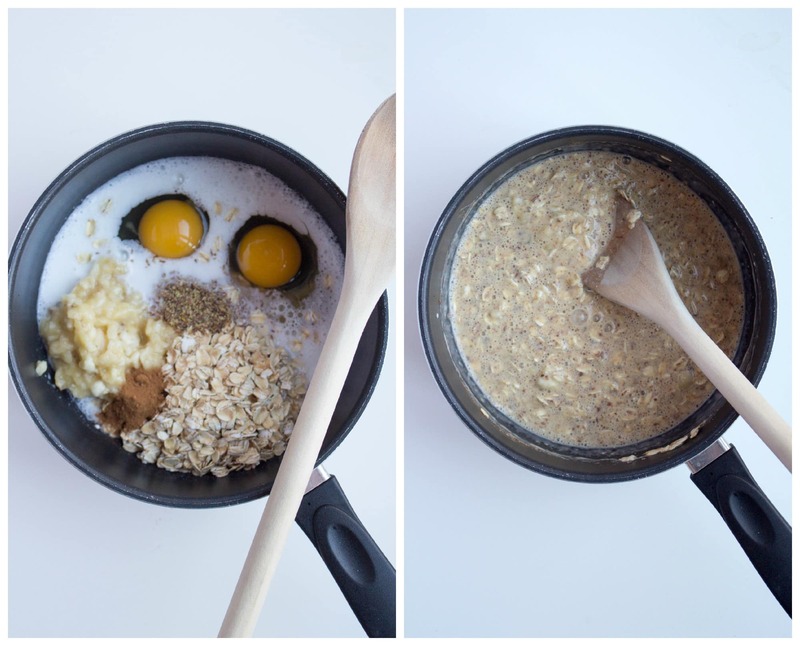 2) Cook, stirring frequently, until mixture reaches normal oatmeal consistency and the eggs are no longer runny. This will take about 5 minutes. Enjoy! Just because I was curious how much protein was actually in this recipe, I decided to calculate the nutritional information. Each serving (this recipe makes two servings) has 13 grams of protein – sweet! Without the eggs (e.g., normal oatmeal), the protein would be half the amount. They really up the staying power of this recipe! you KNOW we love this here, too. Looks great! I’ve been wanting to try this idea but I’m leery because I don’t LOVE the taste of eggs. Why did you decide to use the whole egg vs. egg whites. I personally, am a fan of using the whole egg for the fat and nutrients but I didn’t know how well the yolk would do in the recipe. Yes, I used the whole egg because the yolk is where all the nutrition is! And you can’t taste the eggs at all. Looks very yummy! I’ll have to try it out on a weekend when I have a little more time for breakfast. I’m like you, Anne – always use the microwave for oats. love oatmeal… this post is the perfect thing! i am always looking for a little variation. Thanks for the recipe! I am training for the Susan G. Komen 3-day and any new breakfast that packs a protein punch is a welcomed addition to my morning :) I too am anxious to see if you can make this with the microwave. You should let us know! If you can taste the egg it would ruin it for me. I do NOT like eggs. You can’t – at least I didn’t think so! Thanks for the recipe! This looks interesting and yummy! I make my oatmeal that way everyday using egg whites. if you cook it in the microwave, make sure to stir the oats, egg whites, and milk well before cooking or you’ll get chunks of cooked egg white in your oatmeal (which is gross). i cook it on high for 1 minute and it turns out great every time. I love oatmeal, and that extra protein boost looks awesome! Do you find that there is any egg-y taste? I used 1%. :) And that’s what the recipe calculations are for, too! I should have mentioned that! 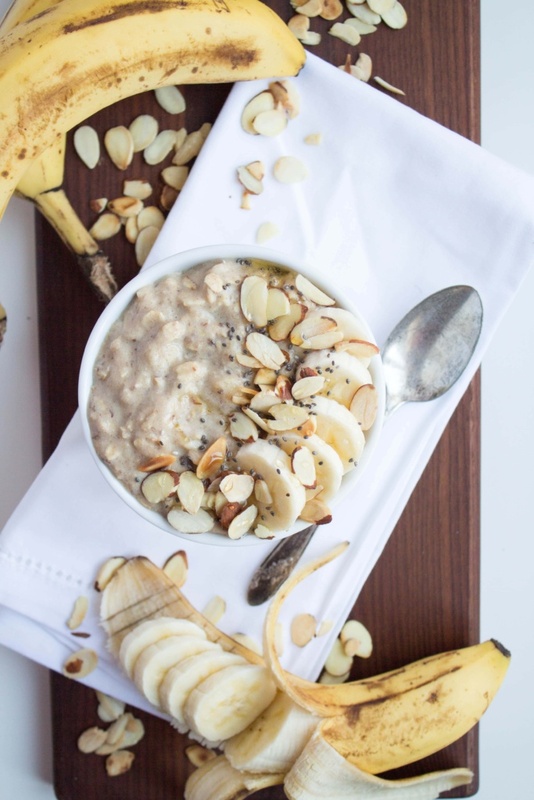 This oatmeal looks great (and so easy)– I can’t wait to whip it up over the weekend. I’ll top it with some organic strawberries. :) Thanks for sharing! Yumm, that looks delicious. I always add some chia seeds and nut butter for extra protein, but I might have to get egg whites a try. Try putting just the egg whites into the recipe on SparkRecipes and see! I think it would be similar. You’d just miss out on the healthy fat from the egg yolks, plus the nutrients. If I were you, I’d leave the whole eggs in. It will help to keep you full longer, which will be better for losing those pounds! Thank you and think you are right about keeping the yokes in. I will be giving it a try. Thanks for the yummy recipe.Nice post. I made this this morning and mmmm so good. You CANNOT taste the egg at all. Have you tried it in the microwave yet? I need to figure out how to speed up the process for the morning!! Just made something similar yesterday – thank you! Didn’t think I would like this but I did. I can’t leave any recipe alone so I am going to add quinoa next time for added plant protein. Thanks for a great nutritious recipe. Quinoa sounds like a fun addition! What does the banana do? I’m allergic to bananas and would love to try this. Will it be possible to make without it? It basically adds sweetness and texture. It might work with applesauce instead… try it! Tried this without the Banana and used olive oil instead of flaxseed. Defiantly using a Banana next time haha! Yikes yeah – the banana is what gives it flavor/sweetness! And I wouldn’t use oil in place of the flaxseed – the ground flaxseed is ground up and powdery, not oily at all so the texture would be weird! Can this be made with steel cut oats? Guessing it wouldn’t be too too different, but just wondering if anyone has tried it successfully. You would need to cook it a lot longer for steel cut! I made this without the banana (because I didn’t have one) and used a mixture of chia seed, buckwheat, and hemp with a few dried apple pieces instead of the flax seed (which I also didn’t have)! I topped it with blueberries and it was fantastic! I didn’t miss the banana at all. I think it would have been too sweet for my taste with banana. Great, inspiring recipe! I’ve made this recipe twice and love it! But it keeps sticking super intensely to the bottom of my pan. Any tips to avoid sticking? Have you tried a little cooking spray/oil/butter in the pan before putting in the ingredients? No I hadn’t. Silly me. I’ll give that a try. Thanks! Thank you for this recipe I would like to do it in a large batch so I do not have to cook it everyday, do you think I can make this recipe for 3 or 5 days without spoiling it? Again thank you for the recipe I really like that I do not have to use added sugar. This looks great, unfortunately I have an egg allergy! Do you think more flax or quinoa would help up the protein? Another thing I like doing is stirring in cottage cheese or yogurt right before eating – adds a lot of protein and tastes good! We do oat groats in the crockpot overnight. Do you think it would be safe to do this recipe with eggs in it in the crockpot? I’m not sure, I’m sorry! It might cook the eggs too much? I made it this morning with 1/2 c. steel ground oats, 3/4 c. Trader Joe’s unsweetened vanilla flavored almond milk, 2 eggs, a few generous shakes of cinnamon and 1 banana. I didn’t have any flaxseed meal. Divided into 2 servings. Wonderful! Kept me filled for 4 hours. Thank you! I’ll try it with the flaxseed meal once I get some and a few sliced almonds on top too. Can you use instant oatmeal oats (fast cook)? Sure! It will just be a bit more mushy vs. chewy. Yum I love poached eggs too – and fried eggs! Try my savory oatmeal recipe! If you beat the eggs and milk ( or whatever liquid you’re using) together before adding it, you’re essentially making a custard base. Adding a little vanilla (or other extract) will mask any trace of egg flavor. Truthfully, only a very sensitive palate is going to detect the eggs in the original recipe. Hi! I am just letting you know I included this awesome recipe in one of my blog posts with a link to your page. Here is the post if you want to check it out! Thanks! Hi I’m trying to plug this into My Fitness Pal app. Can you tell me the nutritional info please? I tried this today as I wanted to add protein to my oatmeal. I followed the recipe exactly and it was a thick mess. There is not enough liquid to allow this to turn into oatmeal as pictured. I suggest adding 1/2 cup water. That’s strange, I’m sorry to hear the recipe didn’t work for you!